Food is surely a universal language of love. On Valentine’s Day, what better gift is there to give? Whether you head for the chocolate shop or your own kitchen, there’s a perfect food gift for any loved one in your life. For inspiration, chefs across the country reveal their favorite edible ways to express their love for their own. For Valentine’s Day, Italians always gift bacio perugina [kiss-shaped gianduja chocolates]. I eat them daily and think part of the reason I became a pastry chef was to eat them more often. My favorite gift to give to a loved one on Valentine’s Day is a pasticcini (little pastries) box. This is something that you can enjoy alone or with someone else. It reminds me of my childhood in Italy, because every Valentine’s Day, my mom would take me to a pastry shop and I would pick eight little pasticcini for us to share. Eataly NYC Downtown and Eataly NYC Flatiron offer customizable pasticcini boxes starting at $6.80 for a box of four. Heart-shaped monoporzioni, desserts made for one, are $6.40. Whether it is Christmas or Valentine’s Day, I always go to Sixth Course Artisan Confections. Those ladies get creative. For Christmas this year, I bought chocolate puzzles and little gnome cakes. Last Valentine’s Day they made cookies with anti-Valentines on it, which I love. One of my favorite edible gifts to give is from William Greenberg Desserts, because it reminds me of when I lived in New York City, and it keeps me dreaming of living there. 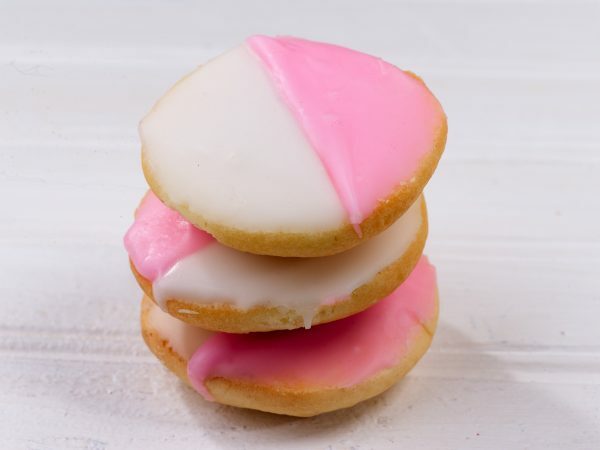 I think they have the world’s best black and white cookies—and everyone goes crazy for them! You can have them shipped almost anywhere, and they arrive moist like they were just out of the oven. They’re never dried out and they ship perfectly. When I think of Valentine’s Day, rosé Champagne comes to mind. My wife loves Champagne and nothing is better than a bottle of Bollinger rosé. In terms of edible sweets, I tend to lean toward macarons and my wife loves a simple chocolate truffle. 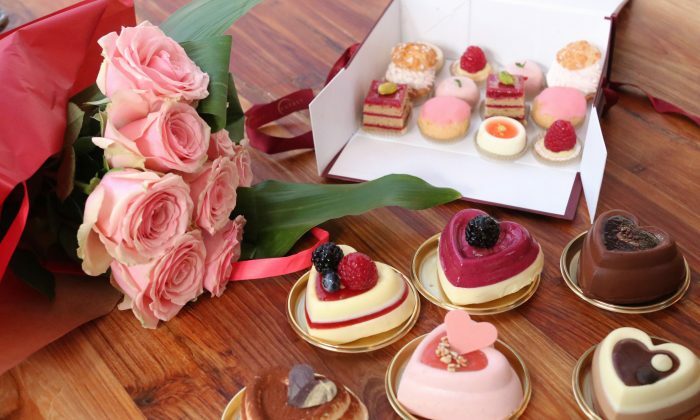 I would recommend ordering from a well-known patisserie or chocolatier, such as Jacque Torres Chocolates, or if you plan enough time, Fauchon or Ladurée in Paris. Ladurée macarons available in stores or online through GoldBelly.com, where a box of 12 is $41. I just had my 12-year (I think) anniversary with my partner, and I am not going to lie: He is the cook in the family. My go-to dish is constantly changing, but a winner every time would have to be meat—just a simple, beautiful aged piece of beef with a glass of wine. 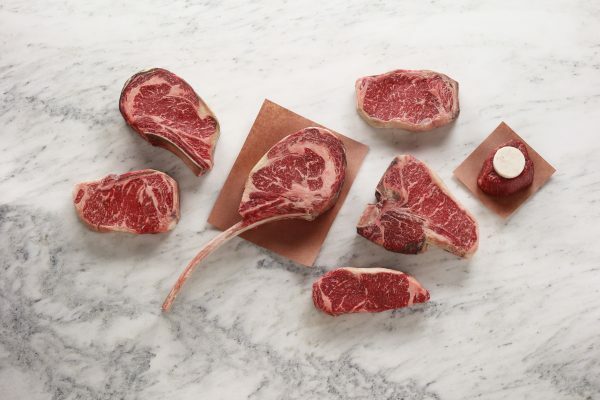 Snake River Farms offers a beautiful selection of dry-aged American Wagyu and USDA Prime beef at SnakeRiverFarms.com. After long days in the kitchen and at the restaurant, my go-to dish that I make at home to impress is usually something flavorful, but also something relatively simple. A dish I continually revisit is something I made my wife when we first started dating, chitarra pasta with braised pork ribs. Using a very simple Provencal-style sauce of tomato, fennel, eggplant, roasted sweet peppers, and saffron, I braise the ribs until they’re incredibly tender and flavorful and add them to the pasta. It’s a simple dish that’s not crazy labor intensive, but it’s from the heart. I should make this more often, actually … but I leave it to Valentine’s Day to really blow my wife away once a year. I make her a red wine risotto with French black truffles from Plantin in France. It is the best and is one of her favorite dishes. Typically, risotto is cooked with white wine, but I love cooking it for her with red wine just because it gives it a touch of the Valentine’s Day color. The decadence of black truffles also adds to the treat of it being a special, once-a-year dish for her. My favorite Valentine’s Day tradition is making my wife breakfast in bed. Each year I make my chocolate chip brioche bread pudding, specifically because it was the dessert I made her for our first Valentine’s Day dinner as newlyweds. She loved it so much that she woke up the next morning and ate it for breakfast. It’s rich, decadent, and indulgent—all the things a Valentine’s Day breakfast should be—and a special way for us to celebrate that memory. Mix together sugar, eggs, chocolate, and milk in a bowl. Add vanilla paste. Pour over the cubed bread and let sit for 15 minutes. In a bowl, mix brown sugar, butter, and pecans together to create a crumble. Pour bread mixture into a square Pyrex pan or casserole dish and sprinkle the brown sugar crumble mixture over the top. Bake for 35 to 45 minutes until set. Remove from the oven. For the sauce: Mix together the sugar, butter, egg, and vanilla paste in a saucepan over medium heat. Stir together until the sugar melts. Add the apple brandy, stirring well. 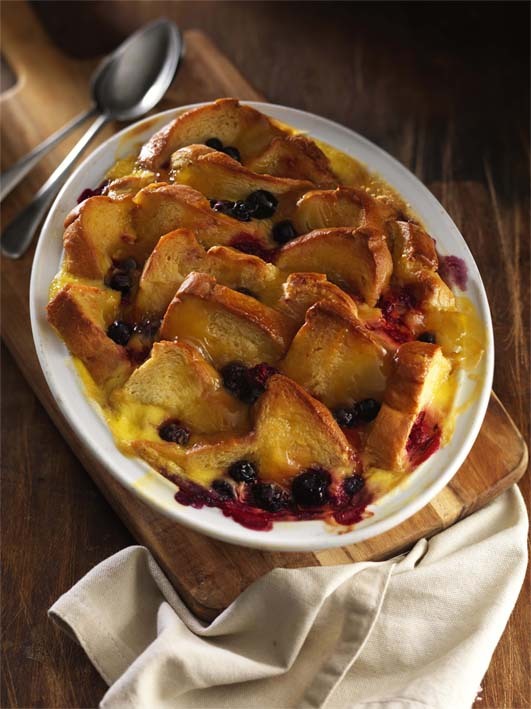 Finish by pouring over the bread pudding. Best served warm or cold. My go-to dish to impress is a deconstructed clam oreganata. It’s a spin on a dish I grew up with in Maryland, and the flavors take me right back to my childhood. It features all of the traditional ingredients in clams oreganata (clams, bread crumb, wine, garlic) but instead of serving it in individual portions, I’ve changed it to a big pot recipe so that I can sit around the table with family and friends and we can all share this one delicious pot of food while spending time together. I love to serve it with sourdough bread from Gjusta in Venice, California—they have the world’s best bread and it’s so delicious dipped in the garlic wine sauce! Because I’ve spent my entire adult life working in restaurants and serving guests on Valentine’s Day, my favorite thing to do is to have dinner at home with my family. I have three young boys and we have a tradition of making dinner for my wife on Valentine’s Day. Every year we make crab legs, shrimp, and corn for her for dinner and I serve it with a nice bottle of wine. My boys love to help cook and serve dinner to their mom to really make it the special day that she deserves! —Donald Moore, chief culinary officer, The Cheesecake Factory, Calabasas, Calif.
For the breadcrumbs: In a sauté pan, heat the butter and oil (add more or less if you’d like) to a light sizzle. Add the bread pieces to the pan and cook until the bread is crispy on the outside but still chewy on the inside. Add the remaining ingredients and toss to coat evenly. Grate the Parmesan over the croutons in the pan to toast the parmesan slightly. Set aside to cool. Bring a large pot to a high heat and add the bacon. Render until crispy. Remove and set aside. Discard half of the bacon fat. In the same large pot, add olive oil, garlic, and chili flakes to the remaining bacon fat. Sweat the garlic. Add the white wine, chicken broth, lemon juice, and fresh and dried oregano. Season with salt and pepper to taste and reduce sauce to your liking. Add the clams and cover the pot with a lid. Cook until the clams are just open. Remove the clams from the pot and set aside, leaving the sauce still in the pot. Add your cooked pasta, butter, and parsley to the pot and toss to incorporate evenly, cooking the sauce into the pasta slightly. Spread half of the clams onto a platter and pour the pasta and sauce onto the clams. Top the pasta with the remaining clams and sprinkle with cooked bacon, breadcrumbs, and olive oil. Squeeze a little lemon juice on top if you’d like. Here are 6 simple ways to celebrate this Valentine’s Day with your family.